Manual Lead Generation Vs Automated Lead Generation – Which is better? Passionate product marketeer with expertise in B2B Sales & Marketing. Lead generation is one of the major challenges faced by B2B Marketing and Sales professionals. 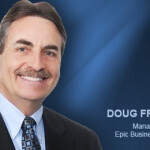 Things get even worse for people who are into email Marketing, because finding the right prospect and their contact information such as business email and phone can be a huge challenge even for the experienced professionals. It takes hours to find your ideal prospect details from the Internet and manually find the business contact information of the person. Manual lead generation is really a time-consuming process and B2B sales people who are always busy making sales calls cannot afford to spend hours on manual research; the time spent on manual research can have a discernible effect on their sales. Why should you Automate Lead Generation? Time is money; people simply don’t have the luxury of time. That is the reason we frequent flights a lot even though the same destination could be reached by road or sea. Similarly, you could automate your lead generation for better speed and accuracy. If a B2B lead generation tool can automate all the hard work of manual research and can help you find the right prospects by giving you their business email and phone, wouldn’t that be great? And also, the speed and accuracy of an automated list builder is unparalleled to that of a person doing that manually. It is like driving a car Vs driving a bicycle. With LeadGrabber Pro, you can find your targeted prospects from various social networks and websites available on the Internet. The tool automatically researches the Internet and finds the work email address and phone number of your prospects. When you are able to generate more number of qualified leads, it opens up more sales opportunities. The image given below illustrates the revenue funnel when you generate leads manually and when you generate leads through automation. Automating lead generation through a lead generation software will definitely have a direct impact on your business. eGrabber has been in the B2B lead generation business for 20+ years. Our patented tools find and append direct work email and phone of your prospects from anywhere on the Internet. You can also download a Free Trial of LeadGrabber Pro and see the results unfold. Your B2B sales success largely depends on how quickly you reach b2b decision makers in companies before your competitor does. You have a fantastic product that has everything to beat your competition; a killer sales presentation and one of the most persuasive & irresistible sales pitch. You are now all set to go… But remember, if you don’t deliver this message on time to the ‘b2b decision maker’ in your prospect company, all your marketing efforts will go down the drain. Why reaching decision makers is important in B2B Sales? Typically, B2B decision makers or C-Level decision makers are a bunch of people who are extremely busy switching between boardroom meetings to conferences to corporate events, etc. You can’t have easy access to these folks. They are often well guarded by gatekeepers whose primary job is to ward off people who aren’t familiar. To make things worse, you just can’t easily find their names and contact information on their websites or on the Internet either. B2B decision makers in Companies decide whether they want to buy your product or not. Therefore, B2B sales folks are often left with just a list of companies. They don’t have any clue about whom to contact and how to contact. So they try reaching the company switchboard, use their investigative skills & try to figure out who the decision maker is and how to reach them. You need to repeat this process for every company and you got to come up with different ways for different companies. Imagine if you had a list of 500 or 1,000 B2B companies, how time-consuming and tiresome it would be? This is where a B2B lead generation software such as eGrabber Management Finder can be handy. How to reach b2b decision makers in 3 steps? eGrabber Management Finder helps you to quickly reach b2b decision makers in companies. It gets you the names of the decision makers and their business email address as well. You can now directly reach the decision makers’ email inbox. You don’t have to waste your precious time anymore to handle gatekeepers or scour through the Internet to find B2B decision makers and their contact information. Click Tools> C-Level Finder > Append C-Level Finders from Company and select any one of the titles (CEO/EQ, CxOs, CTO/EQ, COO/EQ, CFO/EQ, CMO/EQ, Top HR/EQ) from the list. eGrabber Management Finder instantly searches the Internet and displays the names of B2B decision makers. Now, with name and company name as input, eGrabber Management Finder Pro helps you to append email addresses of B2B decision makers. Notes: You can also create a new template to find B2B decision makers in a company. eGrabber Management Finder Pro helps you to easily and effortlessly reach top decision makers‘ inbox in no time. Why would a B2B LeadGen company buy a LeadGen tool? Launch Leads provides USA-based outsourced Lead Generation & Appointment Setting Services. They cold-call a targeted list of decision makers and schedule appointments with qualified companies on behalf of their clients. Clients give them a B2B industry list of companies to target. Previously, their LeadGen team would map out the decision makers manually and then cold call. Launch Leads tried the LeadGrabber tool to automate this LeadGen process. Now the LeadGrabber tool maps out the decision makers, while the team simultaneously focuses on calling. Shorter turn-around time: The LeadGrabber can run overnight, so the team can start calling early morning, the very next day. Serve 30% more clients than before. Are you also looking to jump-start revenue this year? The Internet is one of the best places to generate sales leads for your business. It helps you to generate free sales leads from thousands of websites & online directories. Yellow pages directories, white pages directories, association websites and membership directories are some of the great sources of sales leads. But sales folks find it difficult to copy-paste each contact from the directories into the database. They manually visit multiple websites, flip through hundreds of pages, copy the contact information and then paste them into their database. It takes a lot of their time and effort which eats up their selling time. This is where a lead generation software such as ListGrabber can be handy. ListGrabber is a powerful sales lead generation software that enables you to generate free sales leads from the Internet in no time. It helps you to instantly capture free business leads from any Internet source. All you need to do is, select the contacts/search results on the web page and click Grab on the ListGrabber toolbar. It instantly captures your prospects’ contact information including name, email, phone, Fax, website URL and other relevant details. ListGrabber Standard helps you to generate free sales leads from the Internet and build your own sales leads lists with a click of a button. A quality email list plays a vital role in getting you started with your email marketing programs. What is a good email list? How do you build B2B email list from scratch, especially when you don’t have anything to start with? One of the ways to build an email list can be newsletter signups. You got to have a signup form on your website or partner websites to gradually build an email list. Another way to build a business email list is to manually visit the management pages of the websites and get the email addresses. You can also build an email list by manually searching or rather researching on the Internet. You need to have Internet search expertise here. Using the contact name and company name, you need to find the company website; the email domain of the company and then find email address. If you don’t find the email address of a contact, you need to find email addresses of other employees to identify the email pattern and then frame the email address. If it takes about 10 minutes to find an email address for one contact, imagine how much time it would take for you to build an email list. All the above methods can be effective but they are tiresome and time-consuming processes. Renting or purchasing email lists from list vendors is too expensive. In addition, the quality of the email list is questionable. They are obtained from old databases that usually don’t have updated business contact information. This is where a B2B list building tool such as LeadGrabber Pro can be handy. LeadGrabber Pro is a powerful list building tool that helps you to build B2B email lists. It helps you to capture contacts from online directories, social and professional networking sites, find verified business email addresses of your prospects and build email lists in no time. 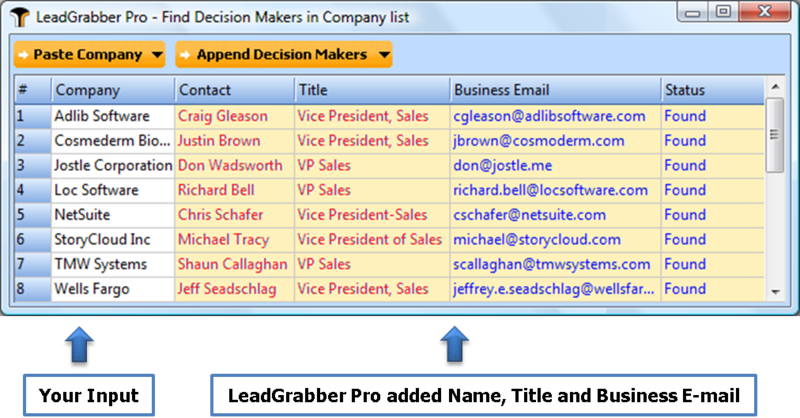 If you have a prospect list with name and company name, LeadGrabber helps you to append verified business email addresses for your contacts. All you have to do is just import the list into LeadGrabber Pro. Unlike rented/purchased lists, LeadGrabber Pro performs real-time searches on the Internet and finds the most updated business email addresses of your prospects. With LeadGrabber Pro, you can build B2B email lists in no time. It helps you save time, improve productivity and of course increase your revenues by contacting the right person at the right time. Real estate agents always look for fresh sales leads to build their sales pipeline. They visit online directories and websites to build real estate lead lists. A real estate business contact list includes property owners, lenders, buyers, tenants, etc. But since they build their real estate contact lists manually, it takes a lot of their valuable time. But, top real estate agents don’t spend too much time on manual list building. They use real estate lead generation tools such as ListGrabber to speed up list building. ListGrabber helps real estate agents to build real estate sales leads lists in no time. It enables them to quickly build their sales lead database and helps them to spend most of their time with their prospects. ListGrabber completely automates the process of capturing sales leads from online sources. All you need to do is, select an online source and click Grab on the ListGrabber toolbar. ListGrabber intelligently captures contact details including name, address, phone number and email address of your prospective buyers & sellers from white pages directories, yellow pages directories, neighborhood listings, local business directories, MLS listings, etc. With ListGrabber, you can transfer the captured real estate leads to an Excel spreadsheet in a click. Now, you have a targeted list of real estate leads in hand that you can start calling right away. ListGrabber helps you to quickly build real estate sales lead lists & become a top producer.